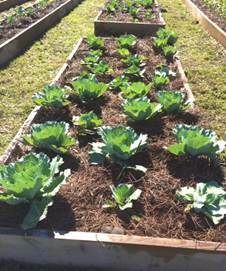 The Community Garden at Ochsner Kenner was first built in the Fall of 2012 on Ochsner Kenner's property behind the Medical Office Building located at 200 W. Esplanade Ave. in Kenner. 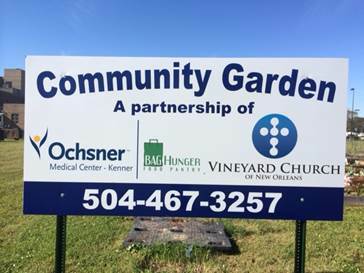 The garden is a joint venture between Ochsner Kenner and the Vineyard Church in Kenner. In early 2014 the garden was relocated, just steps away to an area with better drainage, and expanded. Spring/Summer and Fall/Winter crops are planted annually. Fruit trees were added to the garden in the Fall of 2014. 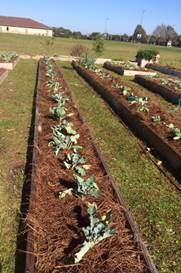 Since inception they have harvested lettuce, rosemary, cabbage, carrots, squash, watermelon, cucumbers, peppers, okra and more! All food harvested from the garden is donated to local food banks. Lemonade Day is a free, fun, experiential learning program that teaches youth how to start, own and operate their own business by running a lemonade stand. Through this nationwide event, each business owner/child sets up a lemonade stand and learns general lessons about running a busines by setting goals, developing a business plan, saving for the future and giving back to the community. From their lemonade stand profits, children must invest a third to their lemonade stand plus donate a third to a charity of choice, keeping the remaining third of any profits for themselves. Ochsner is proud to support such a great cause!